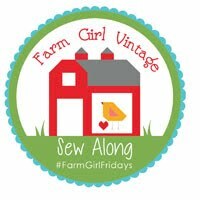 Yesterday, I posted about the Blogger's Quilt Festival hosted by Amy of Amy's Creative Side. 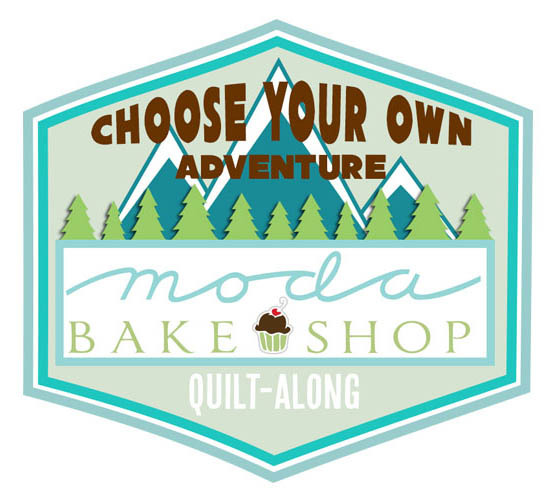 Bloggers can enter a total of two quilts in the festival and there are several different categories from which to choose. 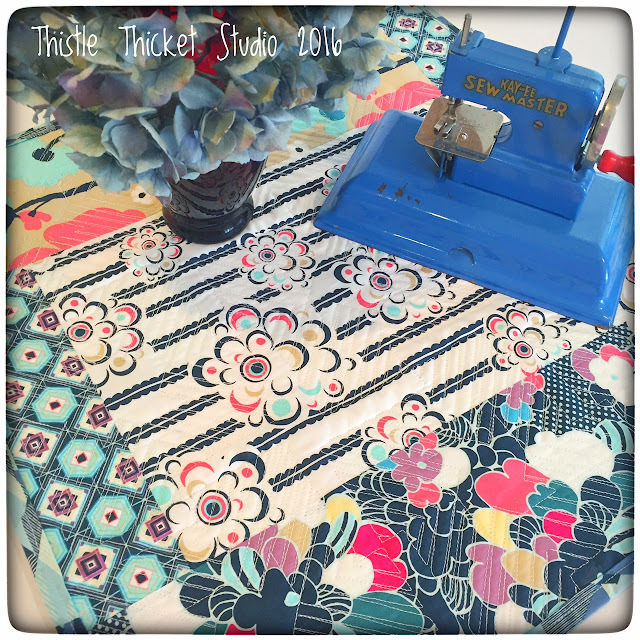 For my second entry, I'm entering my Whirl & Twirl Quilt in the Mini Quilt division. 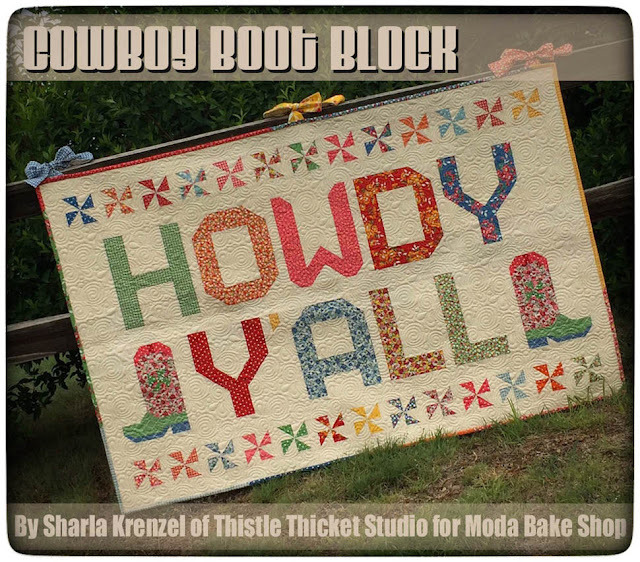 I designed this quilt for the Pat Bravo Minis Blog Tour this spring. It featured fabrics from Pat's latest collections, Dare and Essentials II. We were given a selection of fat 1/8's to work with. I have been exploring blocks that create a secondary design for the last few blog hops I've participated in, and this quilt showcases one of those designs. 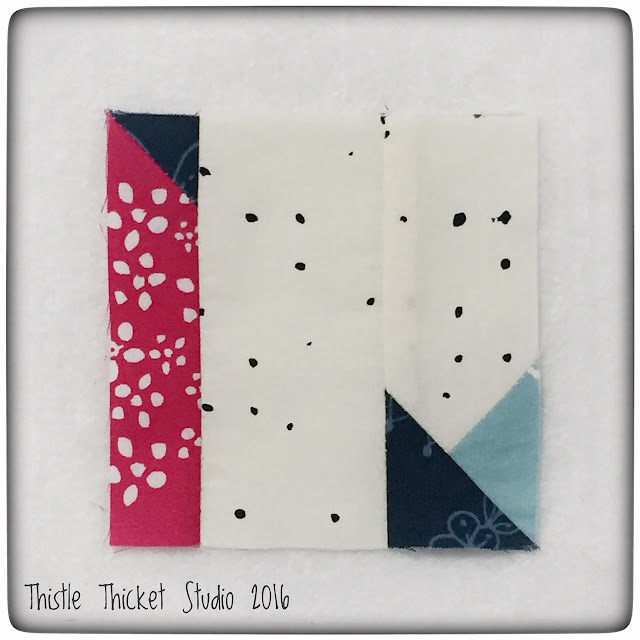 When multiple blocks of this 3" x 3" design are set together, it creates the whirling and twirling design in the finished quilt. I shared a tutorial for this block here. 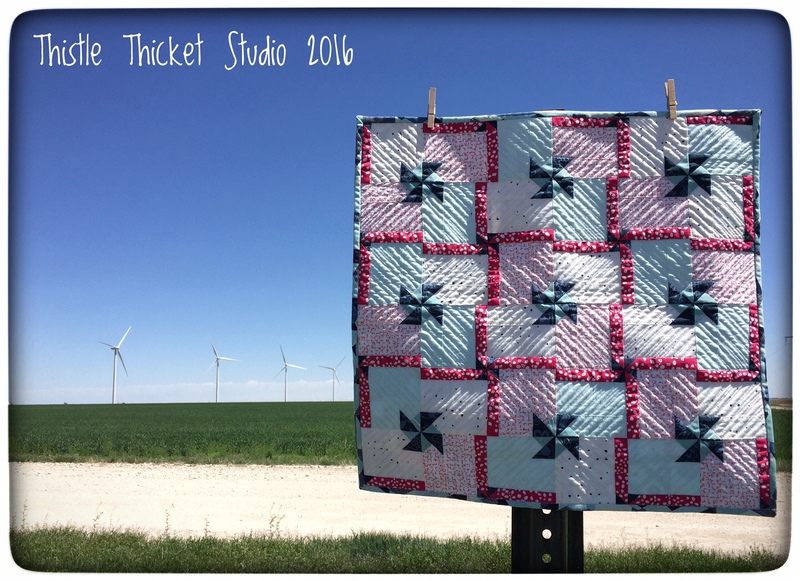 The blue pinwheels in the final design reminds me of the many windmills that have dotted the western Kansas landscape for 100+ years, while the pink blades reminds me of the wind turbines that have graced that same landscape in more recent years. I love this photo with the wind turbines in the background and the shadows that highlight the quilting. 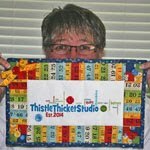 For the backing of this quilt, I pieced together some of the extra fat 1/8's that I didn't use in the design. 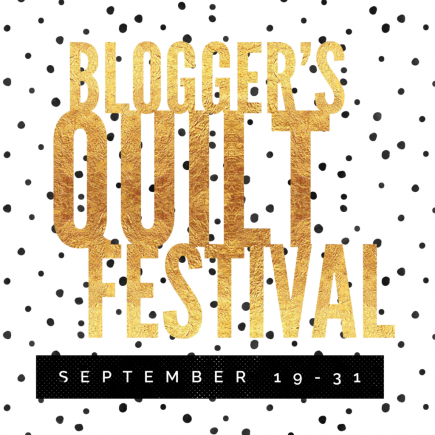 Be sure to stop by the Blogger's Quilt Festival to see all the quilty inspiration shared there, and vote for your favorites (voting starts next week)! Thanks for letting me share this quilt again and for stopping by to visit! 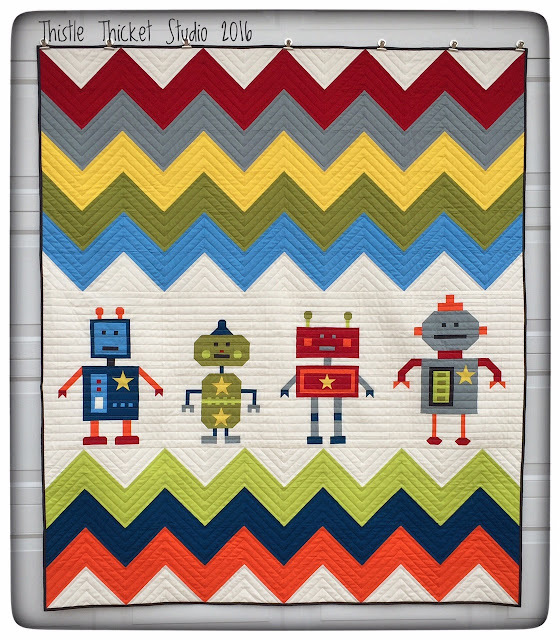 One of my favorite quilts I've completed this year is this Robots All In A Row quilt. I designed and made this quilt for grandson #2 when he graduated from his baby crib into his big boy bed. With the change of beds came new décor with a robot theme. 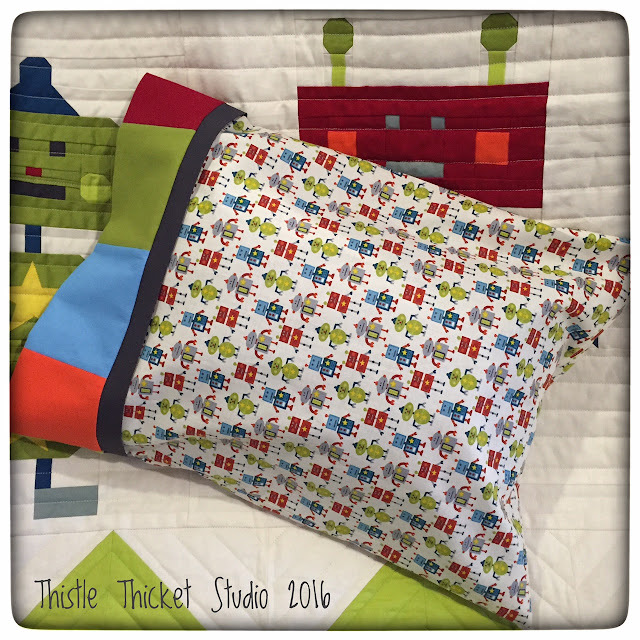 The idea for this quilt design started with this robot fabric I found on our girls Row by Row road trip last year called "Little Monsters Robots" by The Henley Studio for Makower UK. 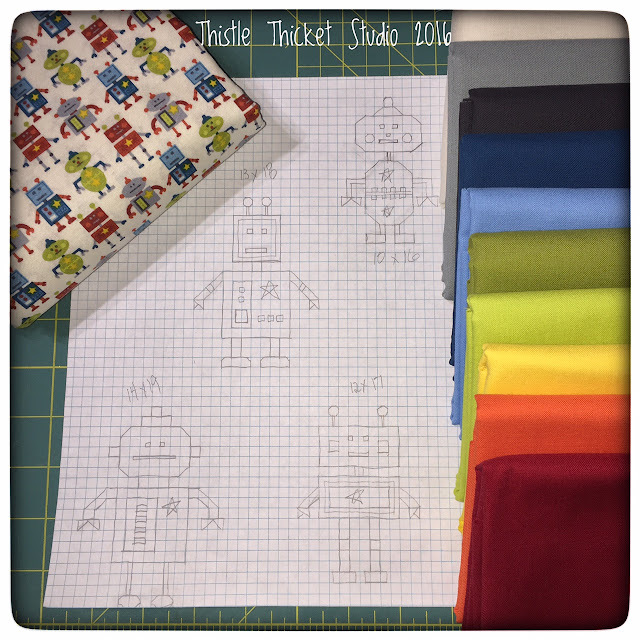 I sketched out each of the robots onto graph paper, then I just started sewing robots with no particular plan in mind. As the quilt developed, the robot fabric moved from the focal print of the quilt to the backing of the quilt. I decided to set the robots in a row surrounded by a field of chevrons. Once the sewing process started, this quilt went quickly, from start to finish it only took me 3 weekends to make. Of course, I did have a deadline of finishing it before my grandson's second birthday. I decided to use straight lines for the quilting, adding to the modern feel of the quilt. I followed the chevron's zigzag for the chevron part of the quilt and quilted horizontal lines across the robots. With the left over fabric from the quilt, I made a pillowcase to coordinate. This was such a rewarding quilt for me to make. I really enjoyed the creative process of designing the robots and seeing it go from a sketch to a quilt. It was also my first solids quilt and I hope it won't be my last! I have always considered myself a traditional quilter, but this quilt has definitely expanded my horizons and I find myself gravitating to more modern fabric each time I go shopping for new projects. 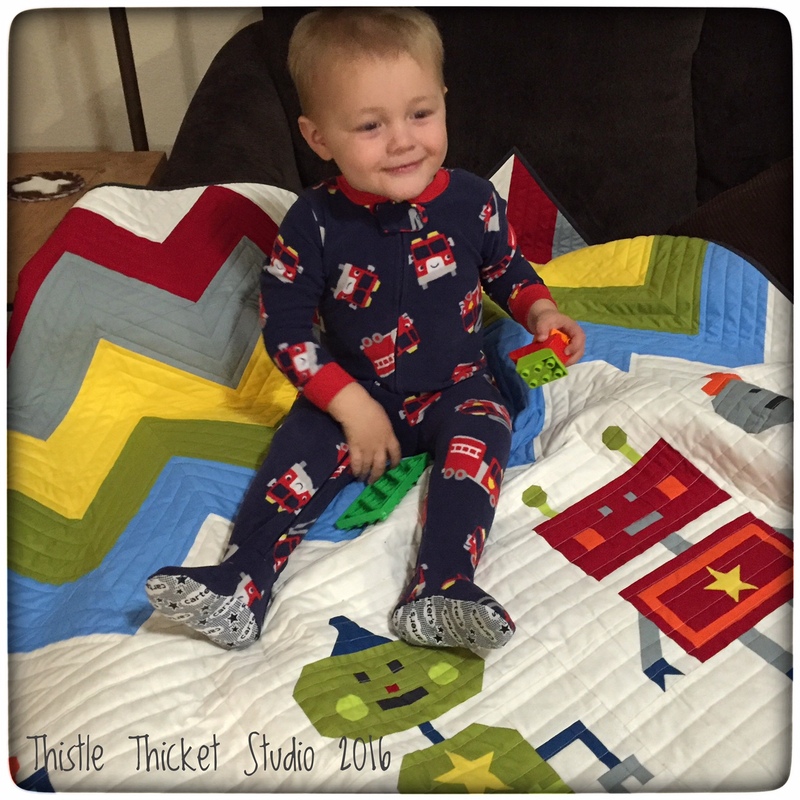 Of course, the greatest reward was making this quilt for such a special little guy in my life! Be sure to check out the Blogger's Quilt Festival and vote for your favorite quilts (hopefully it's mine!) and enter the giveaways! 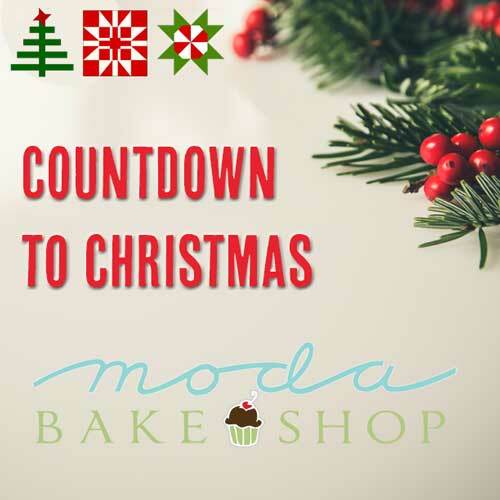 If you enjoyed your visit here, I hope you'll stop by again! A Visit From Jenny of Missouri Star Quilt Co.! My mom has such a wonderfully positive attitude given her current situation, but it was still fun to brighten her day with an epic quilty surprise! On Monday, Jenny Doan, of Missouri Star Quilt Co., and her husband, Ron, stopped by to visit my mom and aunt in the rehab facility. 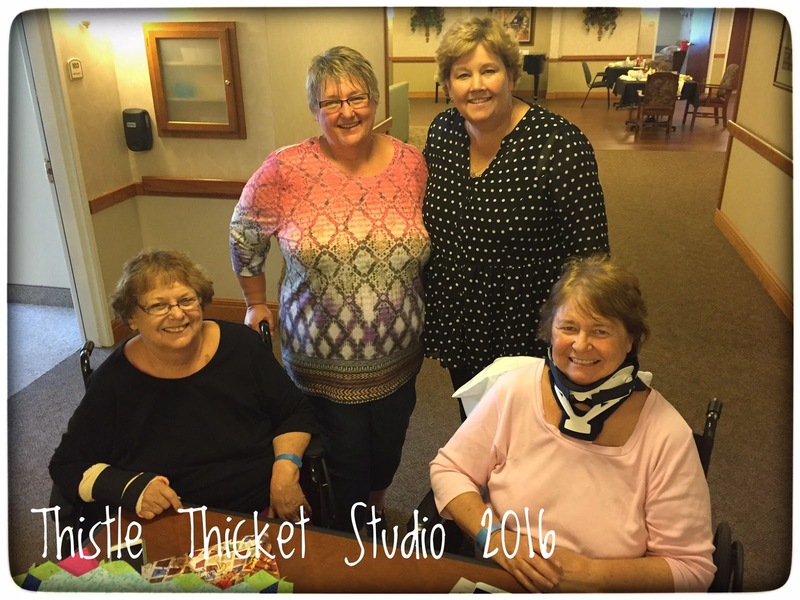 Jenny Doan visits my mom, Janet (left), and my aunt, Judy (right), in the rehab facility following their accident. I so wish I had video taped my mom as Jenny introduced herself, to catch mom's expression as her jaw literally dropped in stunned surprise and her eyes widened in sheer amazement. Mom is a big fan of Jenny and her easy quilting style, but seeing her in the place she least expected made it hard for her to recognize that familiar friendly face from the MSQC videos. Jenny and Ron where so down-to-earth and genuine. They visited about their family, ideas for upcoming videos, their scary car accident and more, as if we had all been friends for years. They were so thoughtful and generous, bringing gifts of flower bouquets and MSQC bags filled with t-shirts (from their 8th Birthday Bash happening this weekend) and books of Jenny's quilter stories. Jenny, Ron and Missouri Star Quilt Co. are a class act. 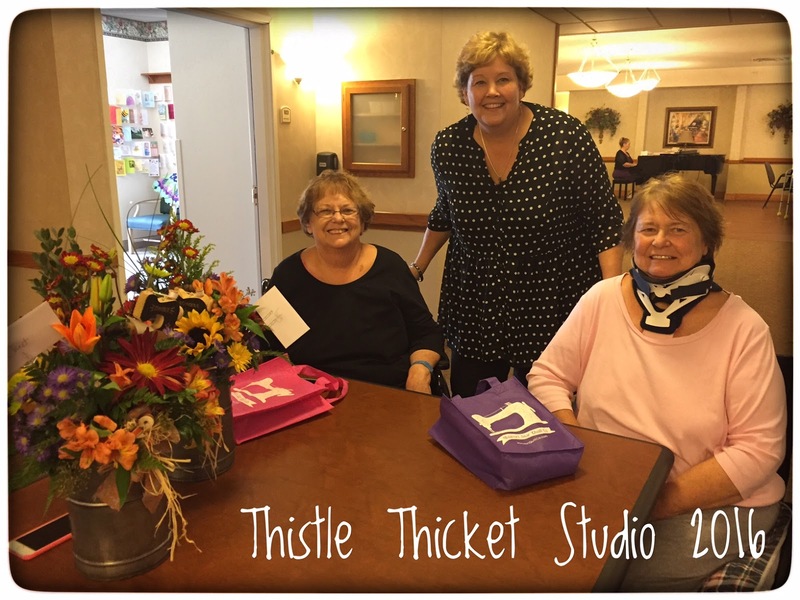 When they learned about the accident, they refunded our group the cost of the tickets for the trunk show we were planning to attend the next day. Then, they went out of their way to spend a couple of hours with us. 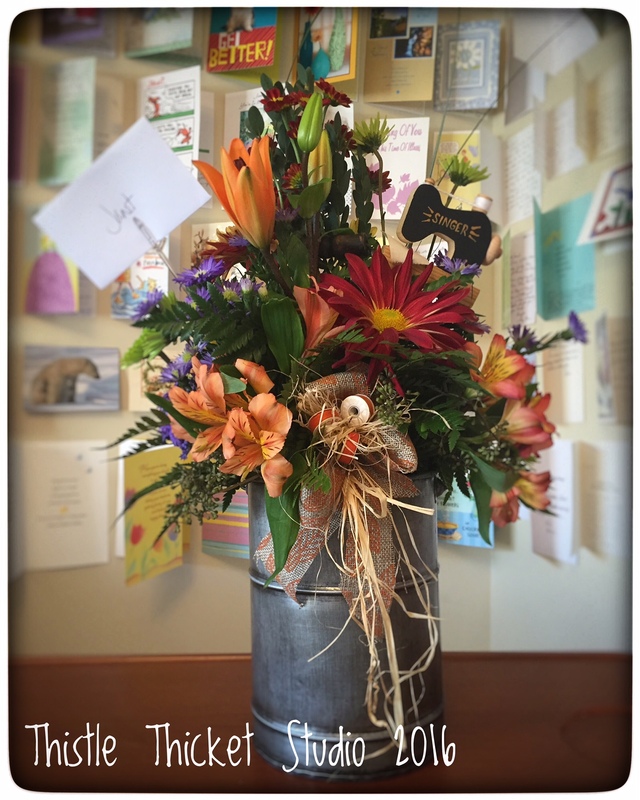 Jenny, thank you for being a ray of sunshine and brightening my mom and aunt's day! I can't wait for my mom and aunt to get back on their feet so that we can reschedule our girls road trip and pay a visit to Jenny and MSQC! I raced home last weekend to help the hubby get ready for fall wheat planting and to throw together a few freezer meals for him, then it was back to the rehab facility to help my mom. While I was home, though, I thought I had to do one creative thing for me. I've had a project I've been wanting to do & I finally had all the necessary supplies assembled, so I thought why not.....which was probably my first mistake! I've seen some beautiful fabrics that looked like batiks but were actually cottons dyed using a technique called Ice Dyeing. The process looked fun although a little messy. 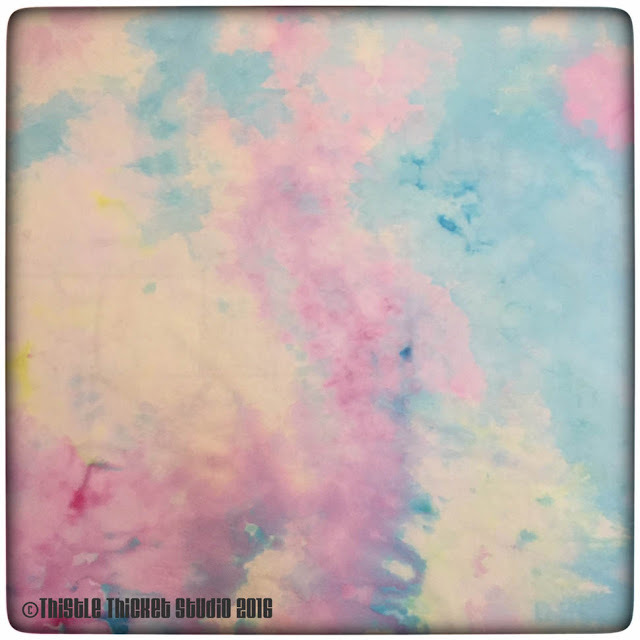 But I decided to face the messiness head-on and enjoyed the creative process, dyeing 2 yards of fabric in shades of yellow, fuchsia and turquoise. The colors came out a nice pastel, not the vibrant colors I'd seen in photos. 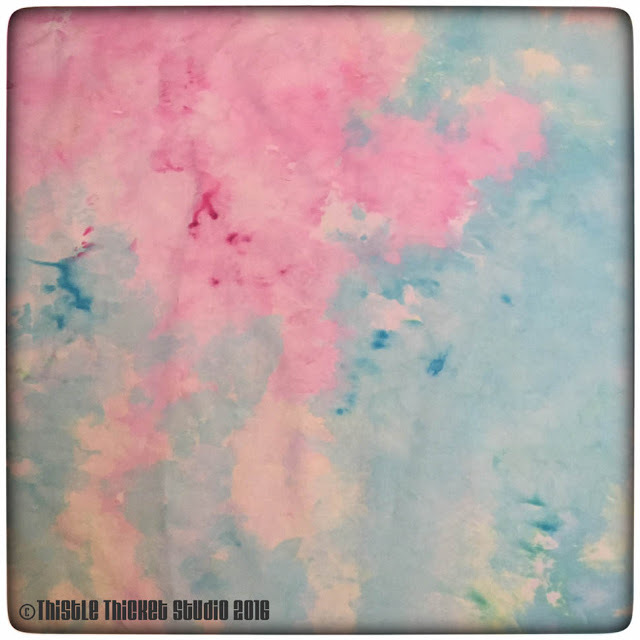 I wondered why, and today I think I figured it out - in my haste, I forgot to soak my fabric in soda ash before I dye it! HELP! I'm now looking for advice on what to do with this fabric. I washed it in Sythrapol afterwards, dried it, and starched and pressed it. Is the dye set? Or will it bleed every time it is washed? Can I over-dye it and use the soda ash the second time around? Should I try to bleach it out and start over? I would appreciate your thoughts and suggestions! Welcome to my stop on Cloud9's New Block Blog Hop. 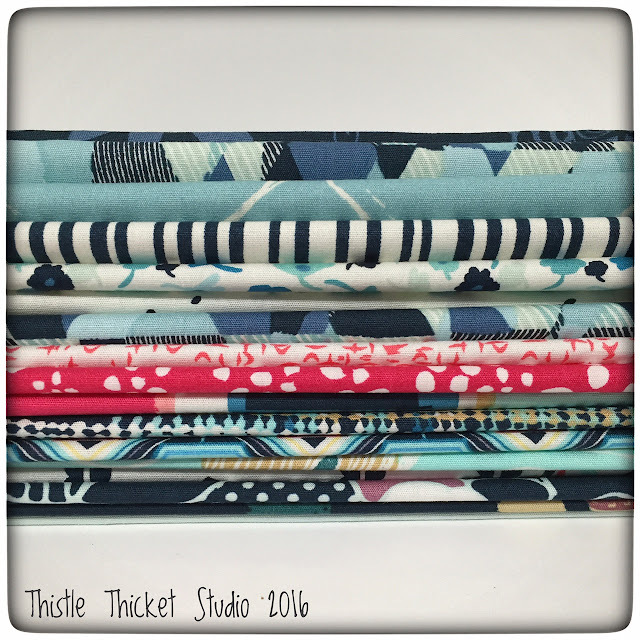 I'm so excited to have you visit and to share my new block design featuring Cloud9 Fabrics' Cirrus Solids in the Berry Harvest color palette. Cirrus Solids are created by cross weaving two similar tones to create a unique combined color with subtle striations and texture. 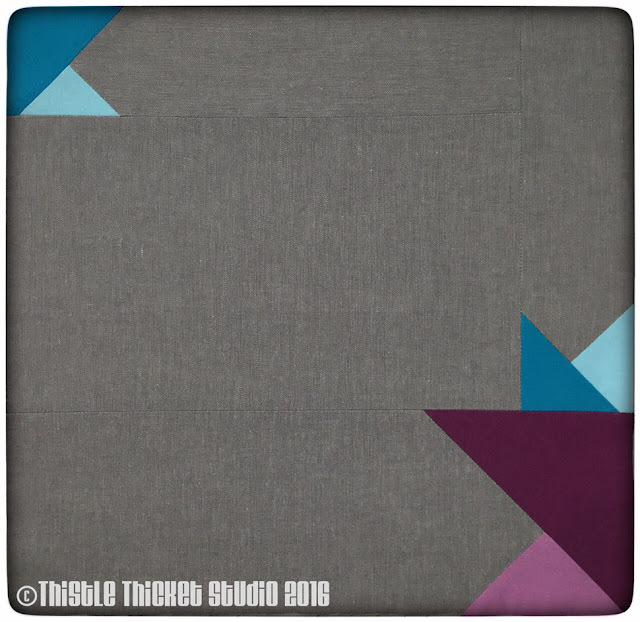 The fabrics add a modern sophisticated feel to projects. Now, without further adieu, let me introduce my block.....Thistleberry Stars. 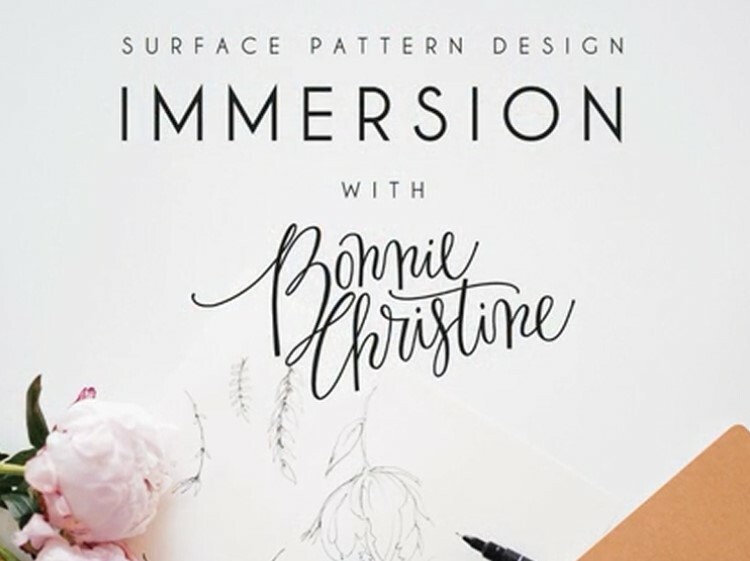 Click here to download and print the pattern. 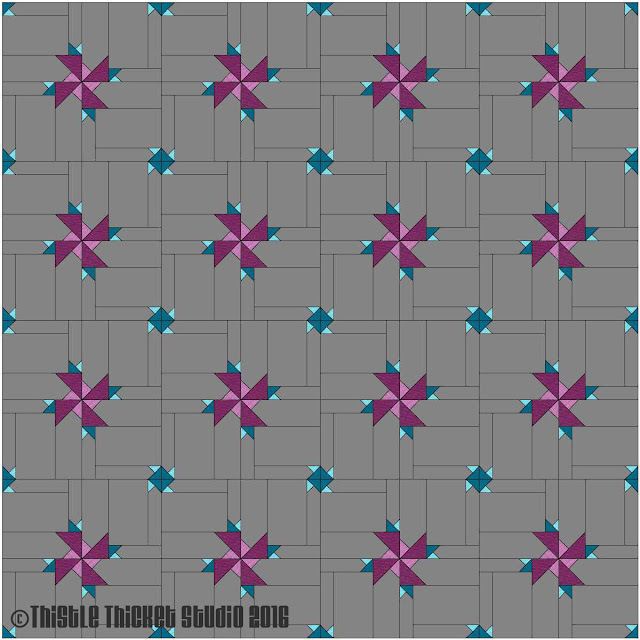 With this block, I have continued my exploration of secondary patterns created from a single block. (You can see my other secondary pattern explorations here and here.) The large star this block creates reminds me of some type of cocklebur or prickly berry, while the small star is reminiscent of the goat head stickers that are abundant in western Kansas. I had hoped to make a mini quilt using 3" or 6" blocks to show the secondary pattern of this block, but unfortunately that didn't happen because of our Row x Row Road Trip disaster. I did, however, include the cutting instructions for both the 3" & 6" blocks, along with the 12" block, in the pattern. 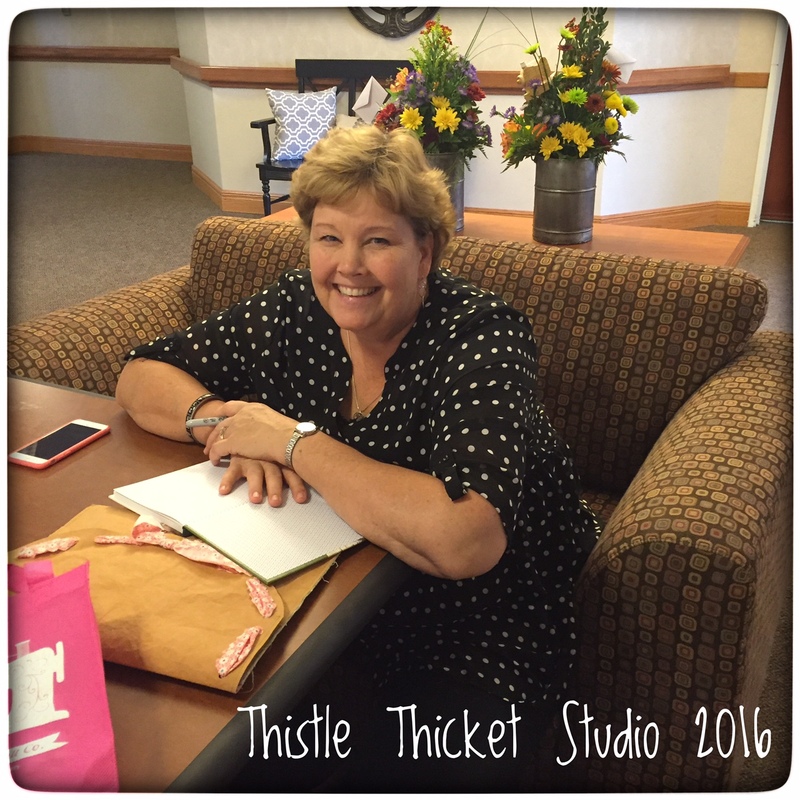 Lastly, I want to thank our hosts - Stephanie, Yvonne & Cheryl - for this blog hop and for the 2016 New Quilt Bloggers group. They have done a wonderful job organizing, educating and connecting us. 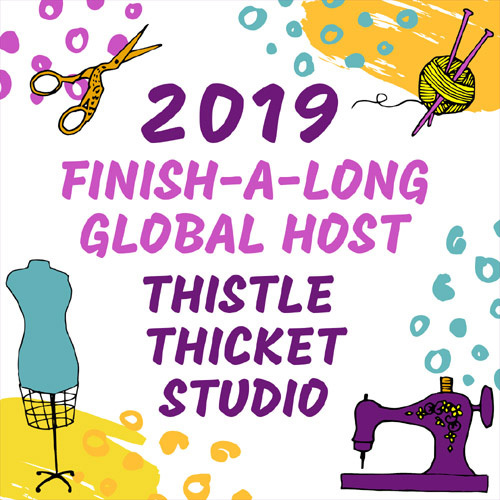 Be sure to stop by their blogs to enter the blog hop giveaways: Stephanie @ Late Night Quilter, Yvonne @ Quilting Jetgirl, and Cheryl @ Meadow Mist Designs. Thank you so much for stopping by my blog. 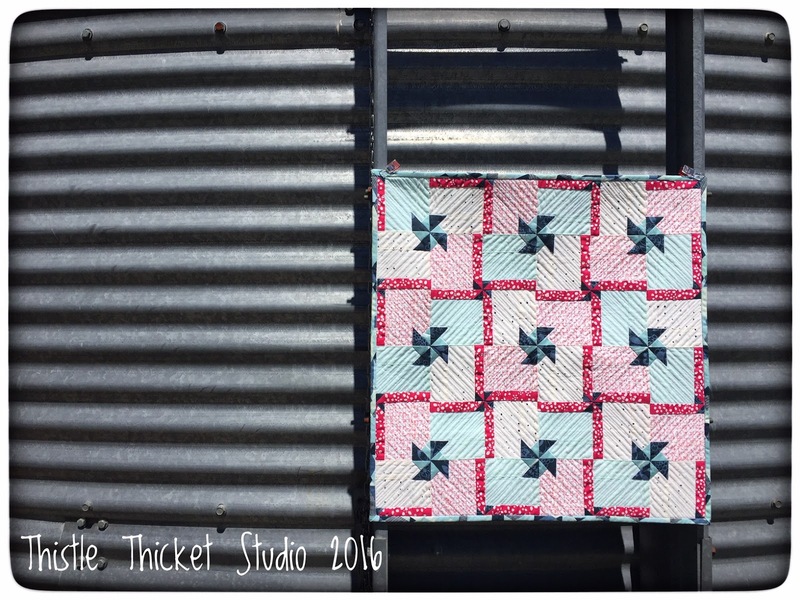 If you make a project using my Thistleberry Stars block, please share a photo with me!